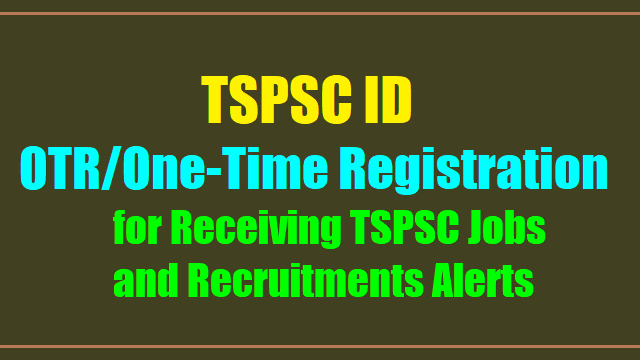 TSPSC ID, TSPSC OTR/ TSPSC One-Time Registration - for TSPSC Jobs and Recruitments Alerts: When a notification releases the seekers face some confusion to know the eligibility, qualification etc. In this confusion sometimes they loose jobs. To keep full stop for such confusions TSPSC brought new changes in recruitment process as already the syllabus and guide lines are changed. The first thing that candidates should do is OTR (One Time Registration). TSPSC implemented this OTR before the release of notification, which will be benefited more for candidates. If once you register your details in this website, according to your qualification TSPSC sends you the details of notifications as SMS and E-mails to your mobiles. So, you need worry about date of release of notification. Your work is that first you enroll all the details that is mentioned in OTR then you need not to give personal details every time. Details to be furnished by candidates: Candidates should first log into the website www.tspsc.gov.in and enter the following details, candidates name, parents name, date of birth, village, Mandal, Dist, Caste, religion, mother tongue, if handicapped that details, if employee furnish that details, present address, permanent address. Educational qualifications: Degree/diploma, P.G or M.phil, Ph.d details with date & year of passing, H.T.NO. If any additional qualification for any splecial jobs furnish those details. Furnish details like marks with % or Grade. Mention moles as in X certificate. Give details of Aadhar number in OTR. After that upload your 3.5 4.5 size Colour /Black & white photo, and write your name and uploaded date with your full signature in JPEG format 30KB volume. Check twice your details once you confirm details then take hard copy print. Then press button ‘send’. By this the process will be completed. Keep hard copy along with your certificates. After verification TSPSC will give 10 digit Password. By this candidates can avail information of all notifications that you want by selecting the any job. If you are careless while furnishing, you may loose good chances and the most valuable period in your life. So, be careful while giving details. 1. Unique Identification Number (UID)/Aadhaar Number: Enter the 12 digit Aadhar Card No. 2. Name as on (UID)/Aadhaar Number: Enter Name as on Adhar Card. Place of Birth: Select the District, Mandal and Village. Private : Candidates who have not studied in any educational institution during the whole or part of preceding years of study in which he/she appeared for the X class examination. In case where visually handicapped and hearing handicapped persons studied in the special schools meant for them, the native place of the parents of such visually handicapped and hearing handicapped person will be the local area. Open Schooling : Recognised by Central / State for Open learning. Local status based on 4 years / 7 years study includes X/10th Class/SSC or equivalent standard. Photograph [3.5cmx4.5cm] should have the name of the candidate and the date on which the photograph is taken printed as shown in the sample image. Signature of the candidate shall be scanned [3.5cmx1.5cm] separately and uploaded here. I hereby declare that all the particulars furnished in this application are true, correct and complete to the best of my knowledge and belief. In the event of any information being found false or incorrect or ineligibility being detected before or after the examination, action can be initiated against me by the Telangana State Public Service Commission or Government of Telangana.